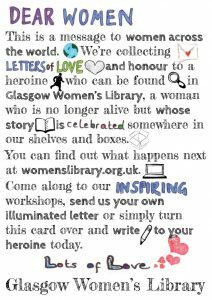 Glasgow Women’s Library and the Gallery of Modern Art in Glasgow are inviting women across the world to write illuminated letters of love and honour to an inspirational woman. The project is inspired by the exhibition of the works of French artist Niki de Saint Phalle at the Gallery of Modern Art in Glasgow. Most famous for her charming Nanas, Saint Phalle incorporated her artistic practices in most aspects of her life, including her letter-writing. Whether they were addressed to collectors and directors of museums, concerning the acquisition of her works by the gallery, or to her family and friends about her traumatic experiences, her letters are concise, enchanting and, most importantly, beautifully illustrated. 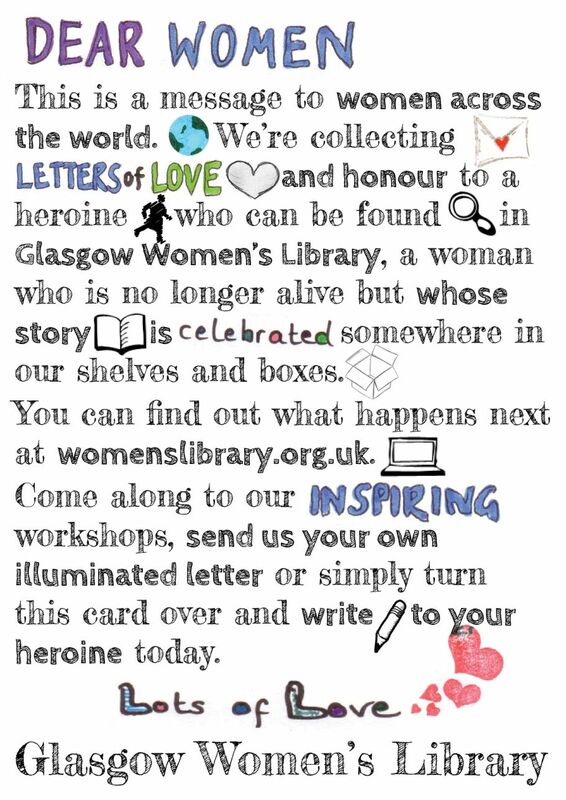 We are inviting women and girls locally, nationally and internationally to create their own illuminated letters to lost heroines: women who are no longer alive but whose histories and achievements are secreted safely in the shelves and boxes of the Women’s Library. All the letters received will be exhibited on International Women’s Day in March 2014. What would you write to your heroine? We have compiled a list of inspirational women which can be downloaded here. However, the list is not exhaustive and we would be delighted if you wish to write a letter to another woman who has been important and inspirational in your life. If your heroine is not on our list of inspirational women, it would be great if you could include a picture and a short biography. The letters can be written in English or any other language (translations are welcome but not a requirement!). Or bring it in to the Library! 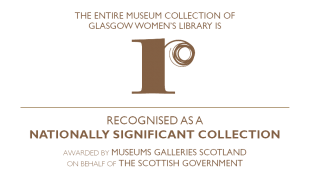 For more information on Glasgow Museums collection of Niki de Saint Phalle works please visit the GoMA website.